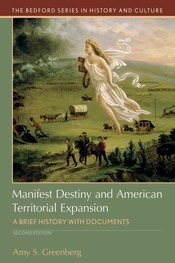 The new edition of Amy Greenberg’s Manifest Destiny and American Territorial Expansion continues to emphasize the social and cultural roots of Manifest Destiny when exploring the history of U.S. territorial expansion. With a revised introduction and several new documents, this second edition includes new coverage of the global context of Manifest Destiny, the early settlement of Texas, and the critical role of women in America’s territorial expansion. Students are introduced to the increasingly influential transnational concept of settler colonialism, while maintaining a central focus on the ideological origins, social and economic impetus, and territorial acquisitions that fueled U.S. territorial expansion in the nineteenth century. Readers of the revised edition will also find an updated bibliography reflecting both the historiography of American expansion and its transnational context, as well as updated questions for consideration.